Frog in Dots, handmade baby quilt patchwork quilt will warm your heart as it features blocks of varying shades of soft green in 100 percent cotton baby flannel of polka dots, stripes, and our friend the frog, mixed with soft pastel green minky fabric. Together they are hand quilted to be both durable and adorable. Backing material is a soft shade of pastel green striped baby flannel which is perfect for reversing the quilt. Hand quilted for durability. The green polka dot binding is hand stitched. Machine wash and dry. Quilt size – 34x 45 inches. 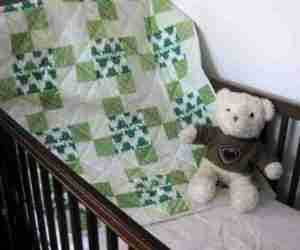 Hand quilted with love for your little bundle of joy by Sharon.